Quantum School of Technology, Roorkee is affiliated to Uttrakhand Technical University and approved by AICTE, New Delhi. QUANTUM, the management is committed to one cause, that is to create and develop professional education & facilities. 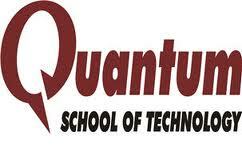 Quantum School of Technology, Roorkee offers various graduate courses as well as Post Graduate courses. Quantum School of Technology, Roorkee is affiliated to Uttarakhand Technical University, Dehradun. List of facilities available at Quantum School of Technology, Roorkee for students.